A “potentially catastrophic” Hurricane Irma is roaring toward northeastern Caribbean islands as a Category 5 storm, the National Hurricane Center said, threatening to slam into Antigua, the Virgin Islands and Puerto Rico by Wednesday before possibly taking aim at the US mainland. Irma was churning Tuesday afternoon in the Atlantic about 180 miles east of Antigua and Barbuda, heading west with maximum sustained winds of 185 mph — well above the 157 mph threshold for a Category 5 — the hurricane center said. The storm’s forecast track currently has it near or over Antigua and Barbuda, St. Kitts and Nevis, and Anguilla by late Tuesday or early Wednesday, and the British and US Virgin Islands and Puerto Rico on Wednesday afternoon. Preparations to protect life and property in those areas “should be rushed to completion,” the hurricane center said in a 2 p.m. ET advisory. “We could see storm surges of 7 to 11 feet — that’s certainly life-threatening — and very, very heavy flooding rainfall” in the far northeastern Caribbean islands as well winds that could cause catastrophic damage near the eye wall, the hurricane center’s Michael Brennan said. 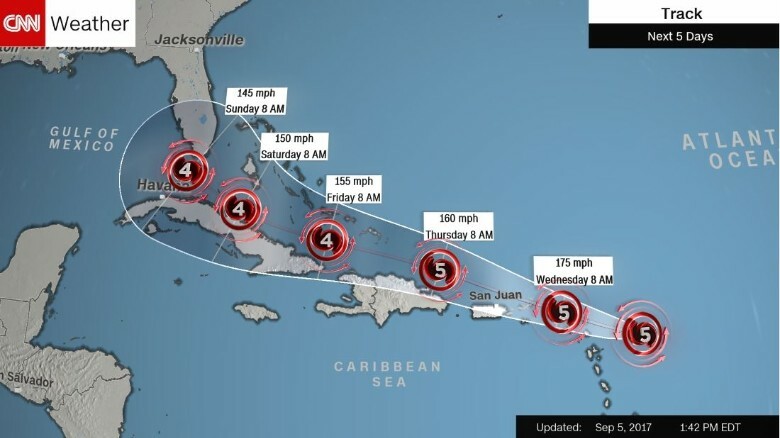 (CNN)A “potentially catastrophic” Hurricane Irma is roaring toward northeastern Caribbean islands as a Category 5 storm, the National Hurricane Center said, threatening to slam into Antigua, the Virgin Islands and Puerto Rico by Wednesday before possibly taking aim at the US mainland. And the state’s Monroe County, which includes the Florida Keys, says it will order visitors to evacuate by sunrise Wednesday, and that it expects to announce an evacuation for residents soon. “We do not know the exact path of this storm, but weather can change in an instant and while we hope for the best, we must prepare for the worst,” Scott said in a statement. Forecasters’ most immediate concerns are for the people of the northeastern Caribbean, Brennan said. Those islands are under hurricane warnings, as are Puerto Rico, the US Virgin Islands, Montserrat, St. Kitts and Nevis, Saba, St. Eustatius, St. Martin/St. Maarten, and St. Barts.